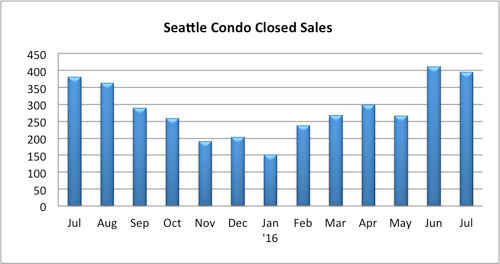 After a blazing start during the first half of the year Seattle’s condo market did not escape the cyclical Summer slowdown as reflected in sales activity last month. Yet, even as the pace of sales slowed, prices continued to rise. 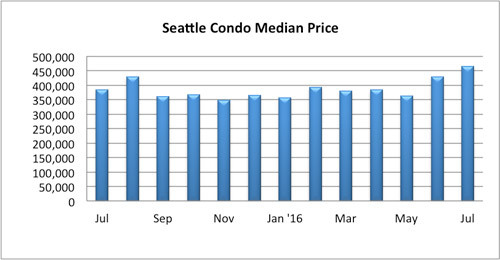 Seattle’s citywide condo median sales price reached a new all-time high of $465,000 in July, marking a year-over-year and one-month increase of 20.8% and 8.2%, respectively. 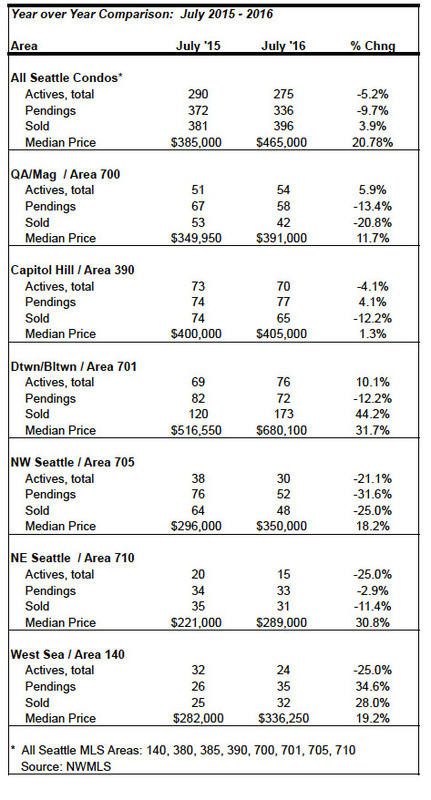 As was the case in June, the median sales price was buoyed from closings at Insignia’s just completed North Tower phase. Excluding new construction, the median sale price would have been $389,500. Comparing resale to resale, the year-over-year and one-month increases were 14.9% and 7.3%, respectively. 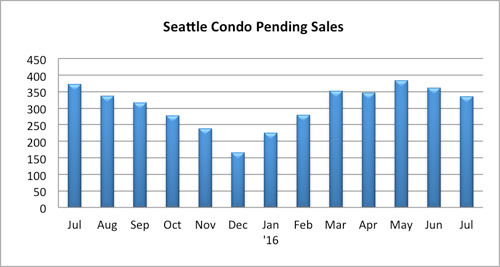 Still, very strong appreciation growth in condo values. 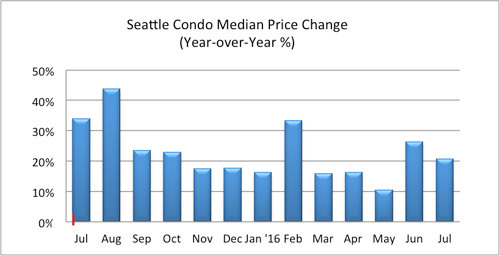 An interesting tidbit…downtown Seattle condos outpaced single family home values last month. The median sales price in downtown was $680,100, while the citywide median sales price of single family homes was $650,000. 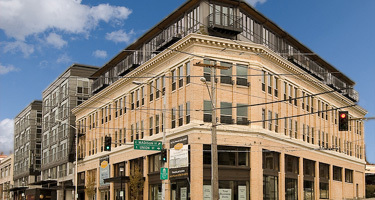 The available inventory of Seattle condos for sale dipped in July to 275 properties, which reflected a one-year reduction of 5.2% and a 1.4% fewer than June. 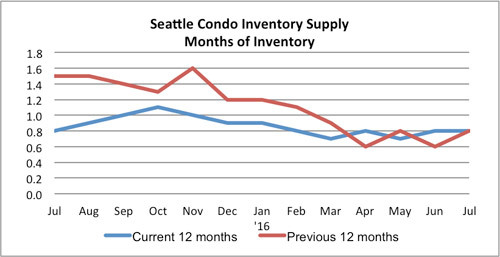 The inventory supply rate remained unchanged at 0.8-months of supply, still keeping Seattle in a very tight seller’s market. Seattle’s housing market is affected by seasonal factors and we typically experience a slowdown and plateau during the summer months as people engage in other activities. July was no exception as unit sales (pending transactions) dropped 7.2% from June and 9.7% from the same period last year. There were fewer buyers buying last month. Part of that maybe attributable to having reduced supply, though anecdotally, there seems to be a bit of trepidation for where the market is headed as well as buyer fatigue setting in from the frenzy of escalating prices and bidding wars. 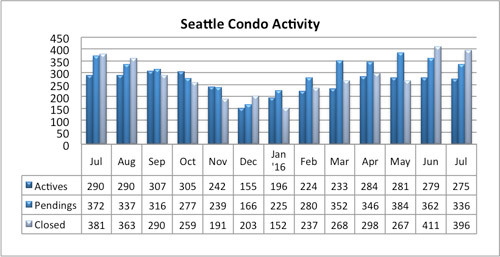 There were 396 condo unit closings in July, a slight 3.9% improvement from last year, though 3.6% fewer than a month ago. Of those closings, 28.7% were at Insignia. If wasn’t for Insignia, the number of (resale) closings would have been down 9.6% compared to last July. As we progress through the second half of the year, the number of unit sales will continue to taper off. Though, the citywide median condo sales price will remain elevated with the completion of Luma, which will begin closings in September.